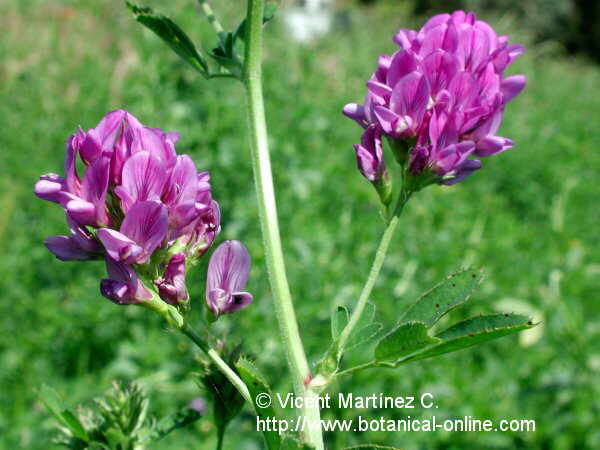 Photo of Medicago sativa L.
Perennial plant of the Pea family -Fabaceae- up to 80 cm. Erect stems, covered with a whitish pilosity. Compound leaves, trifoliate, with obovate leaflets, toothed at the apex. Purple or blue flowers, petals till 1 cm, grouped in racemes 4 cm long at the end of petioles shorter than the calyx tube. Very long main root, from 2 to 4 m. The fruit is a pod from 4 to 7 mm long, spineless, spiral-like, spinning from one and a half till three and a half turns. Widely cultivated as a forage plant and frequently naturalized. It can be found by the side of the paths and roads, sown fields in dry soils of cold and temperate climates.